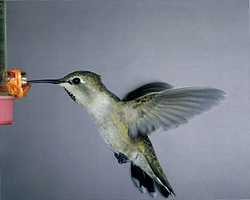 Average weight: male 3.05 g, female 3.22 g. Female birds are larger than males. 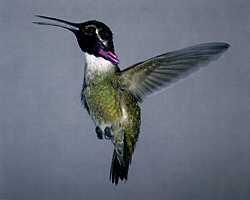 Adult male: Metallic green back, violet-purple crown and gorget with very long side throat feathers, green breast. Adult female: Green back and crown, white breast, white throat with some black spots, buff sides, white tips on outer tail feathers. Observed in Alabama, Alaska, Arizona, California, Florida, Kansas, Nevada, New Mexico, Oregon, Texas, Utah, and British Columbia. Winters in SE California, SW Arizona, NW Sonora, and Baja. Costa's don't migrate very long distances, and can be among the first migrant birds to arrive in the spring.